Zoya Akhtar's forthcoming film Gully Boy is going places and we mean literally. Just a week before its release, the film starring Ranveer Singh and Alia Bhatt, is all set to premiere at the 69th Berlin International Film Festival. We got a glimpse of Alia, Ranveer and Zoya's Berlin diaries through their Instagram profiles. 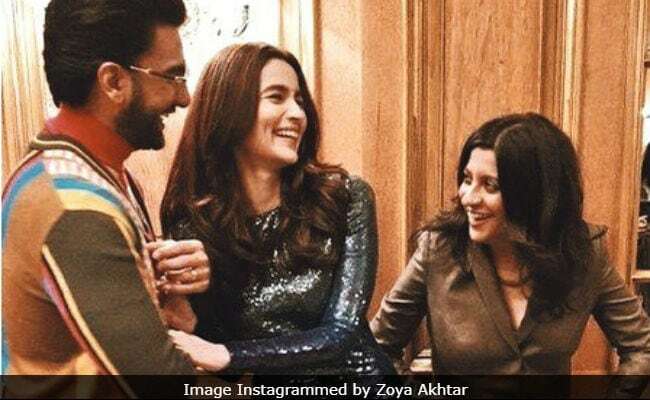 Film's director Zoya shared a picture of herself along with Gully Boy stars Alia and Ranveer on her Instagram profile on Friday night. In the picture, the trio can be seen happily posing for the camera. A few hours after Zoya posted the picture, Alia and Ranveer shared it on their respective Instagram stories. An excited Alia Bhatt has also been actively sharing pictures from Berlin on her Instagram profile. The 25-year-old actress gave her fans a closer look of her outfit. In the pictures, Alia can be seen dressed in a sequined midnight blue dress. In another picture, she can be seen wearing a black trench coat over her dress and a pair of white Christian Louboutin stilettos (as she clearly described in her caption). "Don't even try and knock me off my loubs," read the caption on Alia's post. Meanwhile, Gully boy aka Ranveer Singh also shared pictures. In the photograph, Ranveer can be seen dressed at his quirky best. In the photograph, Ranveer can be seen wearing a bright red sweater, which he paired with a pair of checked pants. Ranveer accentuated his look with a fur overcoat and tinted glasses, which we simply loved.